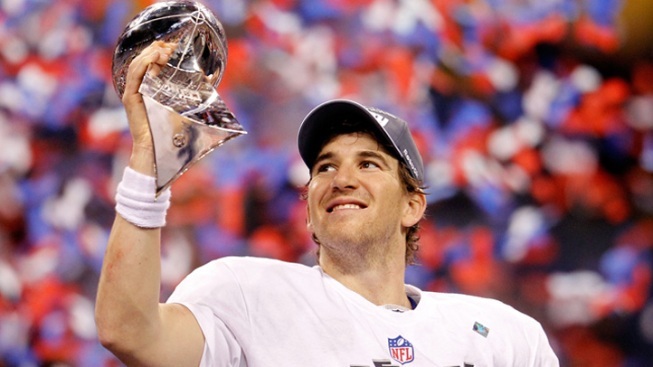 New York Giansts quarterback Eli Manning with the Vince Lombardi Trophy after the Giants defeated the Patriots by a score of 21-17 in Super Bowl XLVI, now the most-watched TV show ever. Sunday's Super Bowl was the most watched television program in U.S. history, according to overnight data from Nielsen. It was also the highest rated Super Bowl in 26 years. A record 111.3 million viewers tuned in to NBC to watch the New York Giants beat the New England Patriots 21-17 in an exciting game that kept most guessing who would win. Madonna, in fact, was a major draw, with an average 114 million tuning in just for her 12-minute halftime spectacle featuring appearances from LMFAO, Nicki Minaj, M.I.A. and Cee Lo Green. The show was the most-watched entertainment halftime performance ever recorded (since 1991). Topping the markets watching the big game were Boston, Indianapolis and Norfolk, Va. New York actually placed 18th. The large audience translated to a great launch for the second season of NBC series "The Voice," giving the music competition show 37.6 million viewers overall for its premiere, just after the game ended. By contrast for a non-Super Bowl night, the most-watched entertainment show previously this season was the premiere of "Two and a Half Men," when 27.7 million tuned in to see Ashton Kutcher take over for Charlie Sheen, according to TheWrap.com on Reuters.